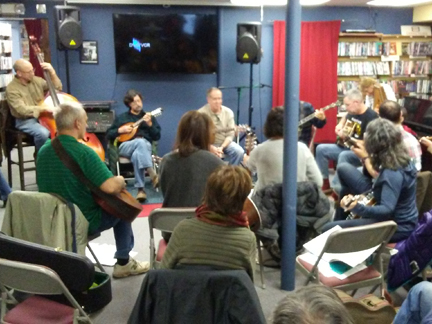 The “First Sunday” Hamden Bluegrass Jam—hosted by GuitarTown CT Productions—takes place on Sunday afternoon, Feb. 3, from 2—5 PM in Best Video Performance Space. There is no cover so come on down—have a coffee, beer or glass of wine and enjoy the music. It’s all acoustic and mostly traditional. Any and all bluegrass players are welcome. Bring your instrument or just bring your ears. Come to pick or just to listen.